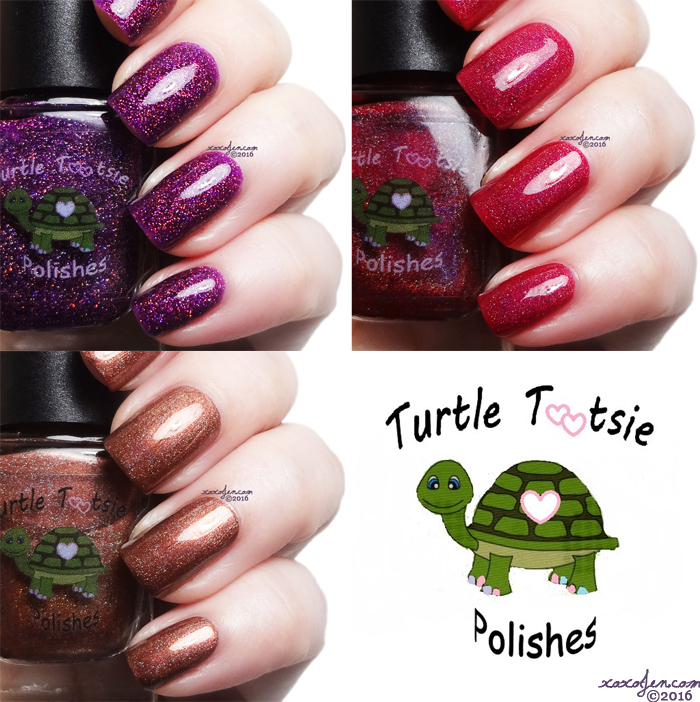 The Turtle Tootsie Valentine's Day collection launches Friday, January 22, at 7pm Central. If you order a full size set you will receive a FREE chocolate-scented top coat! You can also opt to add the top coat for a couple extra dollars if you purchase the mini set. I haven't tried the top coat myself, but it sounds yummy, doesn't it? For each swatch I used two coats with topcoat and each polish has a smooth easy to apply formula. I hope you've enjoyed my review and photos. Be sure to follow me on facebook to see what's next! Beautiful! I love the copper brown shade, but the whole trio is very pretty. Thanks! Difficult choice to make for a fave! Some very nice colors to sport for Valentine's! Isn't it though? Still wearing it! All three of these are such stunners! Turtle Tootsie has such gorgeous polishes! I love Turtle Tootsie polishes! These are all great, but Im really loving the purple! Gorgeous swatches! Love Potion looks amazing! It's a nice squishy one! Oh my...Love Potion has so much depth! Gorgeous! Agree! It's one of those that I wanted to keep adding coat after coat because of the depth it has!